FILE - Chicago Police Officer Jason Van Dyke, shown Nov. 30, leaves the Cook County Jail after posting bond. On Tuesday, he pleaded not guilty to murder charges in the death of a black teenager. A white Chicago police officer who shot a black teenager 16 times has pleaded not guilty to murder charges, as Chicago Mayor Rahm Emanuel cut short his vacation after two more fatal police shootings. Jason Van Dyke entered his plea Tuesday at Chicago's Cook County Courthouse, where he is charged with six counts of murder for the 2014 shooting of 17-year-old Laquan McDonald. Last month's release of police dashboard video that showed the shooting, increased tensions in the city and set off weeks of protests that led to the resignation of Chicago's police chief, Garry McCarthy. 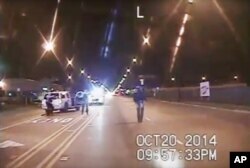 In this Oct. 20, 2014 frame from dash-cam video provided by the Chicago Police Department, Laquan McDonald walks down the street moments before being shot by police officer Jason Van Dyke. The video shows McDonald jogging towards police, and then walking away as he's shot 16 times, many bullets hitting him after he falls to the ground. On Saturday, police fatally shot a 19-year-old male student and a 55-year-old mother of five. Both victims were African American. The race of the police officers involved in Saturday's response to what police called, “a domestic disturbance” has not been revealed. The Chicago police department said when its officers arrived on the scene Saturday they were "confronted by a combative subject, resulting in the discharging of the officer's weapon, fatally wounding two individuals." A police statement said the woman, Bettie Jones, "was accidentally struck and tragically killed." While the police offered little information about the shooting, a report in The Chicago Tribune newspaper said Quintonio LeGrier, the student, was threatening his father with a metal baseball bat when the police were called. The newspaper said it appeared LeGrier and Jones, who was LeGrier's downstairs neighbor, both arrived at their shared front door at about the same time. The Tribune account reports LeGrier's mother, Janet Cooksey, said the family was told her son was shot seven times. Cooksey told the newspaper her son "didn't have a gun. He had a bat." She said "one or two" shots would have brought him down. She said "You call the police, you try to get help and, you lose a loved one. What are they trained for? Just to kill? ...My son was an honor student. He's here for Christmas break and now I've lost him." The Chicago Sun –Times reported that LeGrier’s father, Antonio, filed a wrongful death lawsuit against the city of Chicago on Monday. Mayor Emanuel’s spokeswoman Kelley Quinn said in a statement Monday that the mayor would cut short a family vacation with his wife and three children in Cuba in order to, “continue the ongoing work of restoring accountability and trust in the Chicago Police Department.” She said the mayor had been in constant contact with acting police superintendent John Escalante. The U.S. Justice Department is investigation the behavior of the Chicago police force. Emanuel said it was not acceptable that some Chicago police officers treat African Americans, particularly young men, differently than whites and he regretted that African American parents told their children to be wary of police. Better training of officers is among the police department reforms Emanuel has promised. Other steps include a special panel to investigate internal police practices and reopening closed cases of police shootings found to be justified.